My Honeycomb Sweater is no longer a sweater. 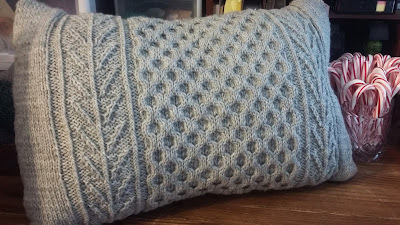 I bit the big gauge bullet this morning and the sweater is now a pillow. I'll admit, I shed a tiny tear when I took that first stitch with the sewing needle. I really, really like the Honeycomb sweater pattern and I hated to give up on it. I'm also not (more like NOT) happy about the recent weight gain but even without the extra weight, the sweater wasn't going to fit. I knew it last year when I was actively knitting the sweater. I just didn't want to admit it. Anyway, I'm now the proud owner of a Honeycomb pillow. I decided to leave the waistband ribbing on when I was sewing it. It's a permanent reminder to check my gauge and that while blocking can perform magic, blocking will never make me a size 2. 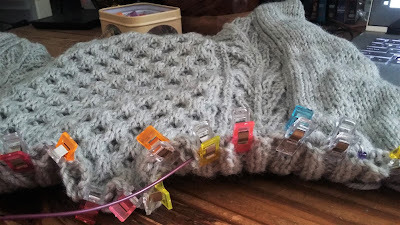 I have to admit, as much as I hated giving up on the sweater turning it into a pillow and checking it off my To-Do list was fairly exhilarating. It feels like a giant load has been lifted from my shoulders. I think that I may have spent the past year subconsciously worrying and stressing about the fit of the sweater. It feels terrific to have it done, even if 'done' means it's a pillow instead of a sweater. My only worry now is, what shall I knit with the gazillion leftover skeins of Dove gray yarn? I'm linking up with Frontier Dreams for today's #CraftingOn. I LOVE the pillow! I've toyed with the idea of knitting a pillow and now I may have to. I'm sure you will find a project for the other skeins!! It's beautiful! 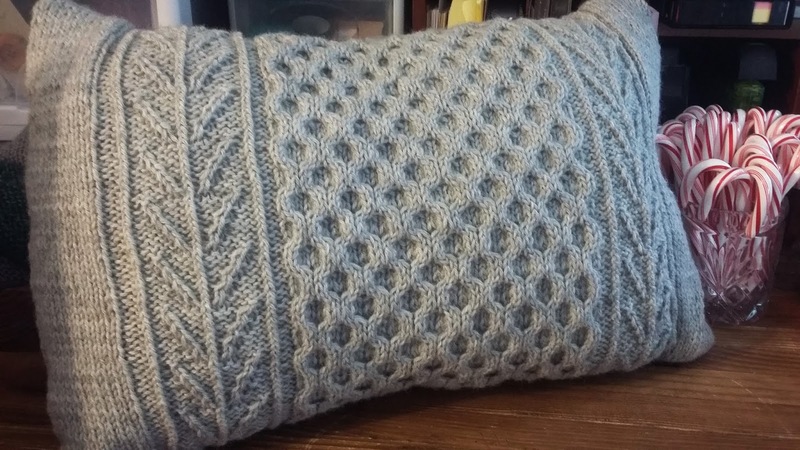 I have a pattern for a real knit pillow that I am thinking I need to just get on and knit it! Thanks! I have a few pillow patterns on the Someday list that may get moved to the To-Do list so that this one won't be so lonely. I love the pillow it is beautiful, so glad you could find someway to use what you had knitted, rather than unravelling it all. Thanks! I'm very happy that I was able to do something with the sweater. No matter how bad the fit, I don't think I'd have had the heart to frog it. It looks beautiful as a pillow!!! Losing the sweater is sad, but if it won't fit it's no use saving it. I love the pillow, a great way to show off that beautiful honeycomb design. 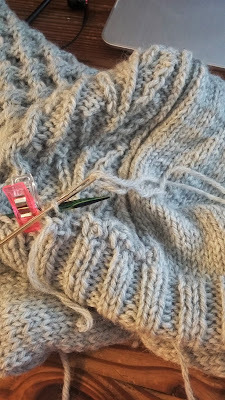 I can see me finishing 2018 out with 48 gray hats (because I had 4 done before the sweater/pillow ordeal.) It could actually be very fitting with my name.